There are few desserts that say class, elegance, and “delicious” quite like a cheesecake. Even the best of home cooks, though, are often intimidated by this classic dessert, and with good reason. It’s one of the tougher ones to master. Fortunately, this step-by-step guide can help. In addition to the ingredients, you’ll also need a 9 x 3 springform pan as well as a food processor, a cooling rack, a roasting pan, a kettle of water, an electric mixer (either a hand mixer or a stand mixer will do), and some foil. Having everything within reach before you get started will save you quite a bit of prep time. You’ll need to preheat your oven to 375 degrees. Do this at least fifteen minutes before you actually put the pan in the oven, as that will give it enough time to reach the appropriate temperature. Grab your springform pan, and butter it with the extra tablespoon of butter. Then, use your food processor to grind your graham crackers. You’ll want to pulse it until you have a bowl of fine crumbs. Pour in your melted butter, the sugar, and &frac14; tsp. of table salt. Pulse just until it’s combined properly. Pour that out into the bottom of your pan, and press in carefully. You want it to come up the side of the pan to about an inch. Once you have it pressed into the pan, go ahead and put it in the oven. It needs to bake for approximately 13 minutes. It should be golden brown when you get ready to pull it out. Let it cool on your wire rack. Before you actually get started with your filling, you may want to go ahead and set your kettle of water on to boil. Then grab your mixer, and beat your cream cheese. You should use a medium setting. You want to beat it just until it’s fluffy. Be sure to scrape the sides of the bowl a couple of times. Slowly add in your sugar, and continue to beat the cream cheese and sugar mixture until it becomes fluffy. Add in the lemon zest, then the eggs. You need to do the eggs one at a time. Scrape the sides of the bowl each time you add an egg. Then add the sour cream. Wrap the sides of your pan in foil. Pour your now boiling water into your roasting pan, and set the springform pan inside the water-filled roasting pan. You only want the water to reach about halfway up the springform pan. Pour your filling into the springform pan. Your oven temperature just needs to be at 325 to bake the actual cheesecake, so either preheat it or reduce the temperature if necessary. Put the roasting pan in the oven, and bake the cheesecake until it is set in the center. It should take you about an hour and forty-five minutes. Once your cheesecake is set, go ahead and take it all out of the oven. Take your springform pan out of the roasting pan with the water, and set it on the cooling rack. It needs to cool for at least 25 minutes. After that, grab a knife and run it around the edge of the pan. Then let the pan cool completely. This step can often take up to an hour. Place it in the refrigerator for at least eight hours, but you can do it for as long as 24 hours without any harm to your dish. 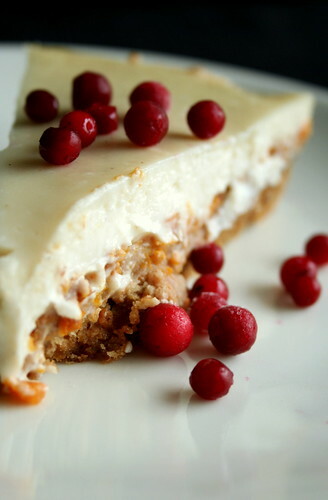 Take your gourmet cheesecake out of the refrigerator at least 30 minutes before you serve it and remove the springform ring. Before you slice, dip your knife in warm water, and make certain you dry it before you slice each individual piece. Top with fresh fruit, if desired. Enjoy! Image by Seitti on Flickr’s Creative Commons. Pinkchic18 is an avid party planner and regularly contributes to the All About Gifts & Baskets gift blog. Follow Pinkchic18 on Twitter for more great articles!